Align all the dials on the front of the lock to zero (or your actual combination if you want to change it again). All Safe Skies™ Luggage Locks are preset at the factory to open at zero so that they align with the red lines. Pull the shackle up and turn it 90° in either direction and press the shackle firmly down. While firmly holding shackle down, set your new combination, so that it aligns with the red lines. (1-2-3-4 in this example). Do not release shackle until you have completed setting your new combination. Once new combination is set, release shackle and pull shackle up completely. Return shackle back to locked position. Lock should not lock since it is set to new combination. Turn one or more dials and the shackle should now lock. Please make sure to remember your combination! Align all the dials on the front of the TSA Cable lock to 0-0-0 (or your actual combination if you have already set a new combination). All Safe Skies™ TSA Cable Locks are preset at the factory to open at zero so that they align with the red lines. Hold the cable lock with the torch symbol on the left side of the lock, and apply pressure to the metal bottom portion of the cable from the right side (A), such that the cable slides down along the track towards the middle hole where one side of the cable can then be removed to be looped through your luggage zipper holes. Once cable is secured through luggage zipper holes, re-insert the cable into the middle hole and send It back up along the track until it clicks Into place. Turn one or more dials and the cable should now lock. Safe Skies™ TSA Cable Locks come preset from the factory to 0-0-0. Set the combination to 0-0-0 or your already chosen combination. if different than 0-0-0. To set the combination, use a pointed device such as a pen to press in on B. While pressing on B (do not release B until combination is set), pick your 3 digit combination. Once all 3 dials are set to the combination you want, release B. Your Safe Skies™ TSA Cable lock Is now set to your combination. TSA Lock will NOT be locked at this new combination - turn one or more dials and your lock will be locked. To unlock, follow instructions above. Some Safe Skies TSA Locks feature GLOW IN THE DARK dials, to make opening your TSA Lock easier at night or in the dark. place your TSA Lock in the sun or under intense light for a period of 2 1/2 hours. Make sure you rotate the dials periodically to expose ALL numbers on the dials to the light, ensuring effective glow effect. After exposing lock to sun or intense light, use the TSA lock in the dark and your dials will glow in the dark, making opening your TSA lock easy. Step 1. 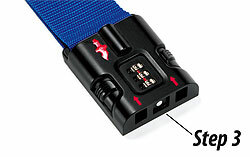 Align the dials on the front of the luggage strap to your unique combination (All Safe Skies™ TSA Luggage Straps are preset at the factory to unfasten at 0-0-0). Step 3. Wrap the strap around your luggage. Step 4. Connect the buckle connectors directly into the lock body. All Safe Skies TSA Luggage Straps are preset at the factory to unfasten at 0-0-0. Step 1. 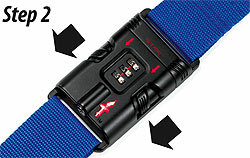 Align the dials on the front of the luggage strap to 0-0-0 so that they align with the red lines. Step 2. Now that dials have been aligned to combination, unfasten buckle by pressing and sliding the release buttons on both sides together. Step 5. Release the pen to complete setting combination. Step 6. Once buckle is re-fastened, lock should not lock because it is set to new combination, turn one or more dials and the buckle should now lock securely. TSA has been extensively trained on how to open Safe Skies™ TSA Locks and re-lock them. However, in the unlikely event that a Safe Skies™ TSA Lock is clipped or damaged by the TSA during travel, we will replace it free of charge.